[JOHN ADAMS]. Newspaper. Columbian Centinel. Boston, Mass., April 14, 1798. 4 pp., 12¼ x 20 in. “They had, however, had some conferences with two persons, (whose names are omitted by the President) who informed them that they were commissioned by Talleyrand Perigord... These terms were, that in the first place a douceur [bribe] of Fifty Thousand Pounds sterling should be made to Talleyrand Perigord... X and Y stated that these were the only conditions on which the American Ministers could expect a favorable reception from the Directory...” (p. 2, col. 2). “Our Commissioners, soon after their arrival at Paris, addressed a letter to the Minister of Foreign Affairs; informing him of the object of their mission, and requesting an opportunity of delivering their credentials and being presented to the Directory. To this letter they had not any answer…” (p. 2, col. 3). 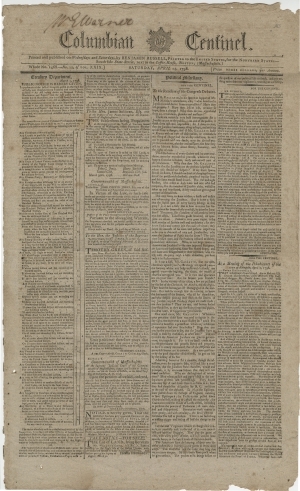 Front page news of an Act passed under Treasury Secretary Oliver Walcott, Jr. that appears similar to the Stamp Act passed by Parliament, which lead to the American Revolution: “‘An Act laying duties on Stamped Vellum, Parchment, and Paper,’...For every skin or piece of Vellum or Parchment, or sheet or piece of paper, upon which shall be written or printed any or either of the instruments or writings following...” (p. 1, col. 1). “In the present case, the illustrious First Magistrate of our country, and one of our most able, faithful and serviceable Foreign Ministers, are charged with receiving too much of the public money...” (p. 2, col. 1). “We are informed from the most respectable authority that Mr. Gerry was not present… at the Paris Ball, given to Buonaparte and wife. Mr. Gerry was invited, but did not accept…” (p. 2, col. 3). “The Day Market Theatre will be opened (by permission) On Monday next, April 16, 1798, for the Benefit of Mr. T. Paine, When will be presented a New Historical Drama in 5 acts (never performed; entitled Daranzel; Or, The Persian Patriot…” (p. 3, col. 1). Despite the Franco-American alliance that had won America its independence, as France’s 1789 revolution became more radical and bloody, tensions between the two countries grew. After the monarchy was overthrown in 1792, the new government started to export her revolution by going to war with Britain and much of the rest of Europe. Rather than supporting our former ally, Washington declared American neutrality. America’s refusal to pay its Revolutionary War debts to France (arguing that the debt was owed to the now extinct monarchy, not the new government) hadn’t helped the relationship. In 1793, the French ambassador to the United States, Citizen Genêt, attempted to circumvent Washington’s Neutrality Proclamation by arriving in Charleston, not Philadelphia (the temporary capitol), and directly recruiting American privateers to fight the British on the seas and the Spanish in Florida. President Washington demanded that the French recall their ambassador. 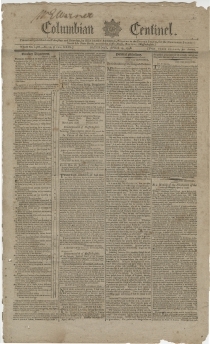 John Jay’s 1795 treaty with Great Britain cemented America’s neutrality, declared friendly diplomatic and trade relations, and ended British seizure of American vessels (at least temporarily). By the time John Adams assumed the presidency in 1797, matters with France were in crisis. That March, the French had refused to accept Charles Cotesworth Pinckney as U.S. minister and began raiding American vessels in the Caribbean. Adams sent John Marshall and Elbridge Gerry to join Pinckney in Paris seeking terms similar to Jay’s treaty with Britain. After the envoys met with foreign minister Charles Maurice de Talleyrand, the French demanded loans and payment of a large bribe before accepting the Americans’ diplomatic credentials. Though this was common practice in Europe, the Americans refused. The French threatened war and repeated their demands for money, eventually provoking Pinckney to utter his famous “No, no, not a sixpence.” Although the American commissioners officially refused, the three would continue meeting with their French counterparts. By January 1798, Federalists Pinckney and Marshall disagreed with Gerry, who continued informal discussions with Talleyrand in relative secrecy. By March, the three Americans admitted that they were at an impasse. Marshall and Pinckney returned to the United States. Gerry stayed through October after Talleyrand threatened war if he too departed, but to Gerry’s credit, he refused any further negotiation with the French. Adams, meanwhile, waited impatiently for news from his commissioners. When it arrived in March of 1798, he opted to keep their mistreatment private, but told Congress of the mission’s failure, and sought to take defensive measures in case of open war. 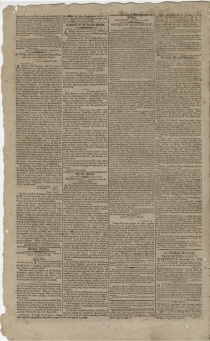 Democratic-Republicans, longtime supporters of France, accused Adams of overreacting, and demanded publication of the dispatches. On April 3, one day after a House resolution called for the president to release the correspondence, Adams did so, substituting X, Y, Z for the names of the French emissaries. The content fueled public calls for war against France. As the situation continued to deteriorate, the United States and France fought an undeclared naval war for the next two years. The conflict is often called the Quasi-War, or the Pirate War due to the adversaries’ reliance on privateering. Over the next two years, the Americans proved their mettle on the sea, losing only one Navy ship during the conflict, while capturing scores of French vessels. But U.S. commercial losses were high, totaling some 2,000 merchant ships. Napoleon Bonaparte overthrew the Directory in November 1799, and the Quasi-War ended in 1800. Oliver Wolcott, Jr. (1760 –1833) was son of Oliver Wolcott, a signer of both the Declaration of Independence and Articles of Confederation as a representative of Connecticut, and the grandson of Roger Wolcott, the colonial Governor of Connecticut. Wolcott Jr. served in the continental army from 1777 to 1779 and was appointed Secretary of the Treasury after Alexander Hamilton. Wolcott Jr. was later appointed as one of the “midnight judges” by John Adams prior to Thomas Jefferson’s inauguration. Later in life he was elected the Governor of Connecticut. The town of Wolcott, Connecticut is named in his family’s honor. Elbridge Thomas Gerry (1744-1814) was one of the signers of the Declaration of Independence and a delegate from Massachusetts to the Constitutional Convention in 1787. He refused to sign the Constitution without a Bill of Rights. He was part of the delegation sent over to France, but was treated poorly during the XYZ Affair. Later he was elected governor of Massachusetts and then served as vice president under James Madison. Gerry’s reputation became tarnished when he engaged in redistricting to favor the political party in power, which coined the term gerrymandering. Thomas Paine (1743-1826) was an English-born intellectual, inventor, and radical pamphleteer who influenced the American and French Revolutions. He lived and worked in England until the age of 37, when he migrated to Philadelphia, joining the radical artisan community there. His powerful pamphlet, Common Sense (1776), was the best-selling original work published in eighteenth-century America and had a pronounced impact on its revolution, making the case for complete independence from Great Britain. He also published a series, The American Crisis, which helped revolutionaries keep faith in their cause – General Washington ordered one number to be read aloud to his men. He later moved to France, published the liberal Enlightenment treatise, Rights of Man (1791), and was elected to the French National Assembly in 1792. A Girondin, he was arrested and narrowly escaped the guillotine during the Reign of Terror. Paine felt that the American ambassador to France – Federalist Gouverneur Morris – somehow pushed his arrest. From this point, Paine turned against George Washington, Morris’s boss, and wrote a scathing public letter to Washington in 1796. Paine remained in France until 1802 when, at President Jefferson’s invitation, he returned to New York.